Happy Saturday! I love getting crafty on the weekends and today I have a really fun funky necklace craft for you to try. I recently got inspired when I saw this necklace and this necklace on pinterest. I think layering up accessories can make the most basic outfit trendy and cute. You could just pile on three or four pieces to achieve this look but if you’re like me, there isn’t always time for that. I usually throw on an accessory as I’m running out the door, so untangling and fastening several necklaces probably isn’t going to happen often. Since I made this necklace last week, I’ve worn it with three different outfits and it seemed to transform each one of them. I loved that I could just grab it and go. For my chains, I just recycled a couple from old necklaces I never wear and then purchased the last one from Walmart for $2. The charms and extra links were also found at Walmart . I really like the look of round discs and found these with Chinese symbols in the dollar bin. I’m not really sure what they say but hope it’s nothing too crazy;) I also love keys so I grabbed a set of those as well. Step 1 | String a charm onto the longest chain. This will probably be the main focal point of your necklace so you might want to choose this to be the largest charm as well. On the second longest chain, string another charm (I chose the key). Step 2 | Decide where you want the second charm to lay on the finished product. 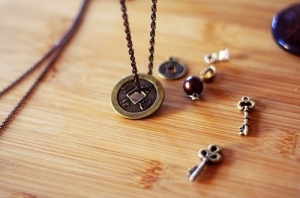 I wanted the key to be attached to the first necklace a few inches above the disc. 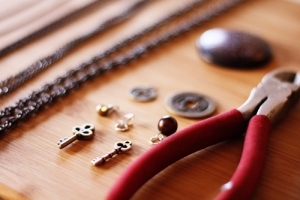 To do this, use your pliers and pry open an extra link, slide it through the chain and the charm where you want it. Then close the link with your pliers. 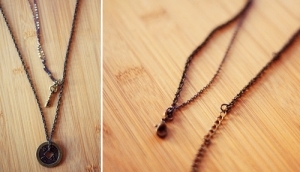 Step 3 | Combine the two necklaces together. Using your pliers again, open the links closest to the clasps on your longest necklace and slide them through the ends of your second longest necklace. Then you can remove any extra clasps or extra length of chain so that only one clasp is holding the two chains together. 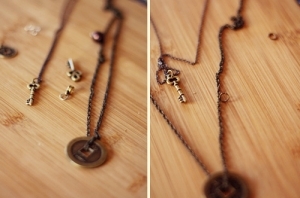 Step 4 | Take a third chain (probably the smallest) and slide on any last charms. Then decide where you want this one to lay. Combine the third chain with the other two like we did in Step 3 with your pliers. 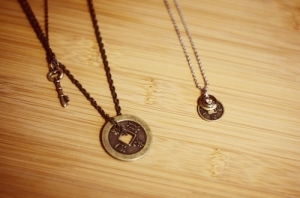 You should end up with three necklaces connected by one clasp. Note: If you’re unsure about where the necklace should lay, a good rule of thumb is to measure in face lengths. For example, measure one face length from your chin to the top of your necklace (the first charms) and then another face length to the bottom of your necklace. 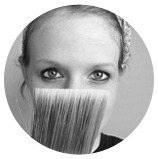 Laurie is a graphic artist and the author of Beauty Divine Design where she posts on everything from design trends and tutorials to her random daily life. She has such a way with beauty, and her taste is divine! Laurie also is the founder of Beauty Divine Design company which focuses on providing photographers with design templates. Click here to visit her shop.